Psychologists (and cleaning companies) report that clients who take charge of cleaning and organising, also take charge of their general health. 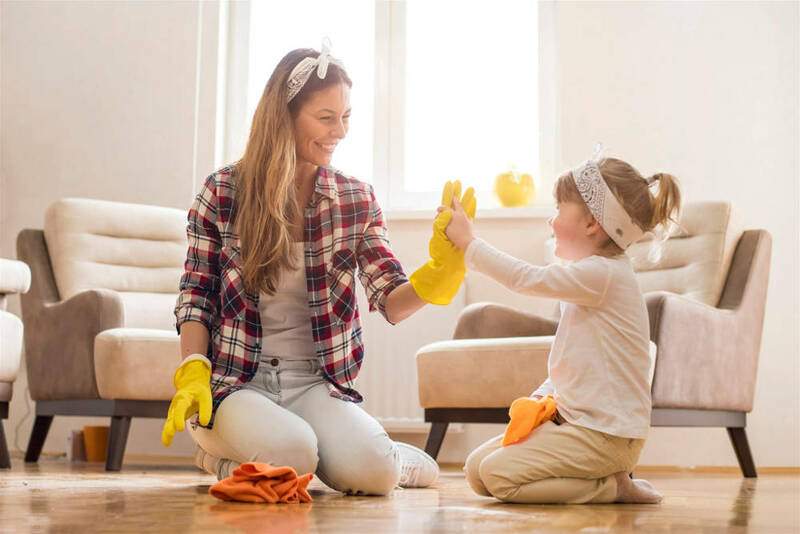 In a nutshell, spring cleaning, says American psychologist Dr Jonathan Fader, has been associated with improved mood, decreased stress, and heightened creativity. Opening windows and letting in fresh air, eradicating everything from mould to stale smells, lift our spirits and give us a fresh start. Washing machine interiors can become grubby, even emitting an odour. Disinfect with white vinegar and bicarbonate of soda (add a quarter cup bicarbonate of soda to a quarter cup water to the detergent container, and two cups vinegar into the drum). Run hot water into the machine – don’t let the machine drain – switch off, and allow this to sit for 30 to 60 minutes. Restart the machine, drain the water, and wipe it dry. Your duvets, under-blankets, and comforters need an intermittent refresh – two to three times a year. Read the manufacturer’s label – most will go into your washing machine quite happily, otherwise, hand wash or dry clean. For stains, make a paste of lemon juice and salt, or mix borax into a paste with a little water. Apply the mixture to the stain, work it in lightly, and leave it for 30 to 60 minutes. Wipe off with a clean towel or vacuum. Refresh your bed, and even give it a nice scent. There are a few recommended methods, but the most popular is to spray the mattress very lightly with vinegar, then lightly sieve bicarbonate of soda over that. Leave it for a few hours, then vacuum up any remaining soda. Many essential oils have antibacterial, antifungal and antiseptic properties, so you can mix a tiny quantity into your bicarbonate of soda – smells good too, and can aid sleep. That burning smell when you put on the oven, means it’s time to clean it. There are a few alternatives, but this works: chip off any loose, burnt pieces; spritz them with ammonia. Now sprinkle bicarbonate of soda and a few drops of white vinegar on the bottom, let it bubble, then wipe with a sponge. Experts suggest deep cleaning high-traffic areas three to four times a year, and other lesser used ones, once or twice, even 18 months for, say, a bedroom. You can do this yourself by renting a machine, or call in your favourite carpet cleaner. If you have loose rugs, clean them every four or five years — or every 10 years if a rug is not walked on much. Overcleaning contributes to wear and tear. Clean kitchen and bathroom tiles with a cleaner with a neutral pH. Alternatively, pour half a cup of bicarbonate of soda into four litres of water, and apply the liquid with a mop. For grout, use the same mixture, but for tough stains, call in the pros. Furniture which stays outside is prone to mildew, and it will get dirty. Mix two cups white vinegar and two tablespoons dishwashing liquid in a bucket of hot water. Work it into the grooves of the plastic, rinse with cold water, and dry in the sun.